If you plan on pre-ordering one of the all new iPhone XS, iPhone XS Max, or the Apple Watch Series 4, tonight is the night. Pre-ordering an iPhone or Apple Watch basically insures that you will be amongst the earliest consumers to get your hands on the latest devices from Apple, as they almost always sell out initially and then it can take weeks or even months for Apple to catch up to the demand. If you’re an early adopter who wants to wait as little as possible to get your hands on an iPhone XS, iPhone XS Max, or Apple Watch 4, then pre-ordering is the way to go. We’ll share a few tips and suggestions to get your pre-order smoothly, increasing your odds of being able to land one of the coveted new devices as early as possible. Pre-orders begin at midnight tonight (technically 12:01 AM PDT on September 14). If you want to be one of those who gets an iPhone XS, iPhone XS Max, or Apple Watch 4 as soon as possible, you won’t want to slack or oversleep. You’ll want to be getting your pre-order in right away at the proper time to reserve your device. Often even just being 15 minutes late is enough to delay your shipment by a week or two, sometimes more, depending on the demand for that particular iPhone model. If 12:00 AM PT is in the middle of the night for you, set an alarm on your iPhone to wake you up a few minutes beforehand. Really, if you want one right away, don’t slack, even if it means waking up at some odd hour to participate in consumer culture. 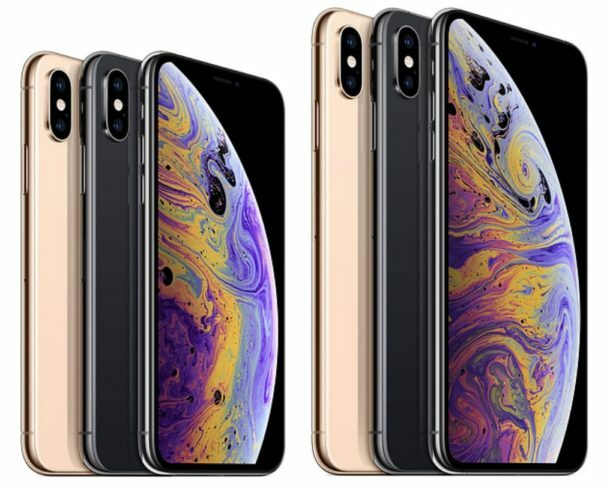 The two main methods of pre-ordering iPhone XS and iPhone XS Max are to use the Apple website, or the Apple Store app. Other options include pre-ordering from a cellular mobile phone provider, like AT&T, Verizon, T-Mobile, Sprint, or whatever carriers are offering the pre-orders in your particular region. We’re going to focus on pre-ordering through Apple here, but you’re certainly free to pre-order through a cellular carrier if you’d prefer to go that route. Using the Apple Website to pre-order is highly effective, but it’s worth pointing out that sometimes the sheer volume of traffic from other pre-ordering customers can cause the Apple websites to crash or underperform, which can delay the pre-ordering process for you (and often everyone else too) by a few minutes. Whether or not this happens is dependent on many factors beyond your control, so be ready for that possibility. Using the Apple Store app is another method to pre-order an iPhone or any other Apple product. It seems that fewer people pre-order through the Apple Store app, so sometimes the Apple Store app pre-order process will work when the Apple Store website fails due to heavy traffic and demand, potentially offering a minor advantage in some situations. If you’re going to use the Apple Store app, download it to an iPhone or iPad, then get your payment details squared away ahead of time. You also might want to familiarize yourself with the general process of ordering through the app, it’s simple enough, but if you’re half-asleep from being woken up in the middle of the night you might be glad you rehearsed the process ahead of time. It’s like training for a marathon, except it’s not at all. Pre-ordering the Apple Watch Series 4 is the same as pre-ordering an iPhone XS or iPhone XS Max, but of course you’ll be selecting an Apple Watch Series 4 instead of an iPhone. Nonetheless you can pre-order the Apple Watch through the Apple Website, or the Apple Store app just the same. Have fun, it’s sort of a game right? What about pre-ordering iPhone Xr? The iPhone Xr is also available to pre-order, but at a later date. Instead of being available for order at the same time as the XS models, Apple has postponed the pre-order date of iPhone XR to October 19 (also at midnight), with a ship date of October 26. Good luck with the pre-order process, and have fun! Pre-Order iPhone 4 on June 14! I’m still on the fence, not sure if I will order an iPhone XS Max or not. I already have iPhone X, which is a pretty good phone… do I need a bigger screen? That’s the only real question, as the hardware is basically the same as is the design. This is the first iPhone I did not pre-order, I already have iPhone X as well and there is nothing to this one. Been an iPhone owner since the 3G. This is actually the first iPhone I have not pre-ordered since iPhone 4S which was also a completley forgettable phone back when the only new feature then was Siri, whoopyfreakindoo what a dud that turned into anyway. I can’t figure out what the feature tentpoles are for XS and XS Max, bigger screen and shiny chrome gold color options? What’s the selling point here? I watched the quick keynote recap, I don’t get it, it’s just an iPhone X. Personally if I was on an older iPhone Plus I would probaly order the iPhone XR. It’s the same phone as the XS but has the LCD screen which won’t give some people headaches and eyestrain like OLED does, plus the screen is bigger than XS, and the camera is the same with the same features minus the second lens which apparently doesn’t matter anyway because the second lens isn’t even needed for portrait mode. There is not enough to differentiate them but a very large price tag and even larger price tag. It’s a confusing lineup this year. I feel like we’re in the Performa / Centris era of iPhone. Dozens of iPhone models barely differentiated by anything other than high prices or colors. The iPad is also confusing, but the iPad is basically a kids toy and a grandparents Facebook browser so that is much less relevant to productive people who use electronics for work. Meanwhile, I’m still waiting for a MacBook Pro with a good keyboard that doesn’t jam up from dust, has ports I need like USB A and HDMI, and that has the escape key. Will Apple ever serve up such a computer again? Because I would buy that immediatley. I would love my sentiment to change, I’m a lifelong Apple user, but ultimately that is up to Apple and their product team. If they keep releasing uninspired unproductive stuff, it won’t be bought by me. How exactly do you refresh the app? What I’ve done in previous years is quit the app and then open it again. Does it refresh automatically, or is that the best way to do it? That’s what I did, quit and restart the app every time until the apple store was back online. It showed up sooner on my iPad via the apple store app than on the Mac. Since I used Apple Pay and had the desired item selected before hand, it only took one or two taps to preorder. Got a sep 21st delivery date. disappointed apple discontinued the SE. the new phones are way too expensive. You’re not alone with that thinking, I know a lot of people who adore the iPhone SE and the small size of it and wanted that updated. What I don’t get is why didn’t Apple redo the SE with an edge-to-edge screen like the X, XS, XR anyway? That would have been so cool, compact iPhone with a nearly 5″ screen would be doable in that format. But I will say this if you are concerned about the size of the iPhone: I have iPhone X and the size is good. I came to it from the Plus which is huge and bulky, and the iPhone X feels much smaller in the hand and pocket. The iPhone X has the same footprint as XS, so that would be comparable to you. You can also find used iPhone X now for more reasonable prices beause the early adopters are flushing them on Ebay and Craigslist to get the new iPhone XS (I really can’t tell you why, I ranted about this in another comment further up I genuinely don’t know the selling point on XS). But the expensive aspect is a real big deal, and I get that. Apple is pushing the price up up and up. It won’t be long before we have $2000 iPhone models for sale, mark this comment and we can laugh about it in another few years when it happens. I think Apple is pivoting to a luxury goods company, led by Angela Airenheardt who will surely be the next CEO when Tim Cook decides to run for president some time. I think he will retire and hand the company to Angela, who is a luxury goods background. So the company is less about selling electronics and gadgets, more about selling very expensive luxury status goods, like most other luxury retailers. That’s my hunch, I wish it were not the case because Apple as an electronics company and computer company is the most exciting company to exist, but that company left with Steve Jobs and we are in a different era now of luxury and high prices and recurring revenue streams for wall street dividends. Times changed! I think you are correct about Apple pivoting to a luxury status goods company. They are behaving just like Tiffany’s or Giorgio Armani charging a premium simply for the brand name, without much innovation and without a big quality difference with their competitors. And I also believe it’s mostly Angela Ahrendt’s doing. I first noticed her influence with the Apple Watch launch. Instead of launching it like they used to launch iPhones and iPads, Apple limited the launch to online orders and a total of just five physical stores worldwide. And the stores weren’t Apple stores, they were fancy jewelry and luxury stores in a couple of countries. Also a result of Ahrendt’s influence was, I believe, the $10K gold Apple Watch edition. Terrible idea to become a luxury company, because technology should never be a luxury available to jus a few people. That makes me sad, but I think you are right. Technology should not be a luxury but that is where Apple is headed. By the way, where is iPhone 9? Just never going to exist? Like Windows, skipping the 9 version? Weird. The $1,000,000 question is, will the software bugs, that have existed for years, get fixed?